I often bump into Frances during school runs which is not a difficult thing to do seeing our daughters are in adjacent classrooms. After months of seeing her wearing one incredible outfit after another, often complimented by beautiful one of a kind necklaces, I had to interview her. She has a devil may care attitude to dressing wearing pieces that are rare and extraordinary. She has the most remarkable way of wearing vibrant colors and making them work for her. I thought I had pretty crazy adventures but nothing compared to her! She along with her husband and two young daughters have been to remote villages infested with the Taleban. Frances also made some of the jewellery featured here. She can be contacted on presentmyself@yahoo.com for any inquiries regarding her jewellery. I'll let you read her story yourself. 1. You seem to have led such an exciting life. Can you tell me more about your life as an expat in Turkey? Well, first off, thank you so much for giving me this opportunity to think about my life. I have never thought about it as 'exciting' but now I am sitting down to reflect on my life experiences I can see there have been some very satisfying and interesting chunks to it. I lived in Turkey for four years with my family. We posted out to Ankara , the capital, in 2005. 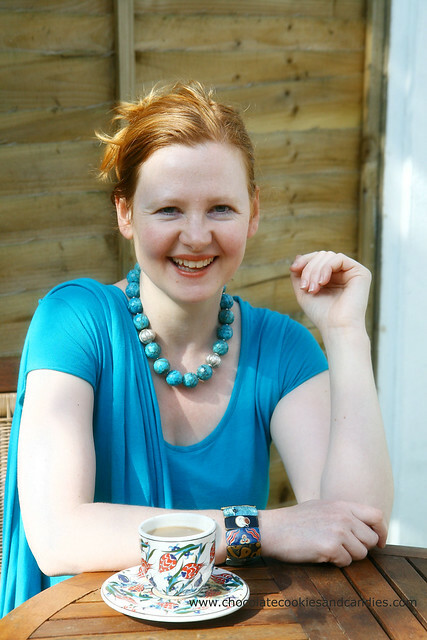 During our time in the city I thought of my expat existence as a sort of 'life finishing school'. I mentioned this to an extremely well travelled friend I met out there and she agreed. You meet so many nationalities on the expat circuit, well travelled individuals with such diverse life experience. You also attend a great deal of events. The formal ones are known as receptions (see my reception nightmare below) and are dressy, other events informal. I should add that expat life could be very mundane in part. For example, some days I would do my teaching work and then shoot to Migros for groceries. The difference between the UK and living an expat life out there was that after Migros more than likely you would change and go out to meet all sorts of fascinating, and frankly not so fascinating people in the evenings. There were a lot of opportunities that I would not have here. For example, my mother had a stash of fabric purchased in Dickens and Jones of Regent Street back in the late fifties and early sixties. She had always meant to have it made up but never got round to it. I took most of it back to Ankara along with some dress patterns I selected from the 'Vintage Vogue' collection. I had the fabric made up by a wonderful tailor who loved working with the patterns and the fabric. I left all the patterns with her when I left. I recently wore one of these beautifully made outfits to a Buckingham Palace garden party. 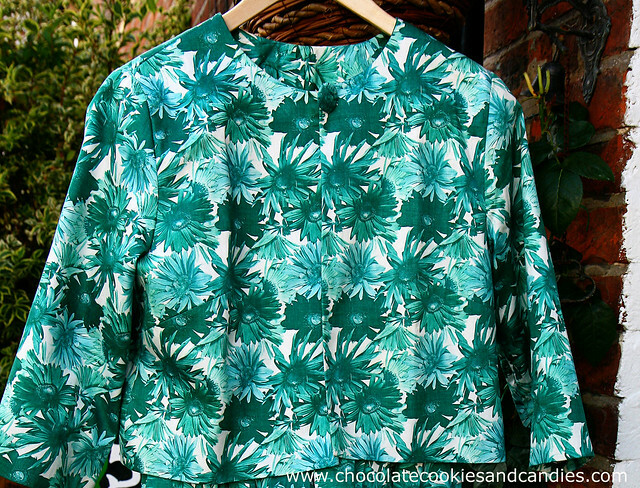 It was a 1950's pattern dress and jacket with a design of emerald green gerberas. The fabric is very eye catching and the outfit was certainly good enough! I wore it with a peacock fascinator, purchased to wear for a play I was in in Ankara. Great fun! 2. Where have you traveled to? Of all your adventures, what would be your most memorable experience? And the worst? Oh my. Well, travelling to Pakistan in 1996 was a real eye opener. Frequently I would be the only observable female in the vicintiy. A memorable experience was using the shower in a guest house in the Swat Valley and the light going out due to power shortages. There was a hole for a window (no glass) but a very bright moon shining a distinct light. All was going well when in through this hole came an enormous black spider. My apologies to lovers of these creatures but the sheer size of it's thick black legs and bulging abdomen was too much for me. I bolted with only a very small thin cotton cloth making me decent, streaking onto the balcony like an ill fated palid shooting star. My (now) husband was chatting to some very local gentlemen on the balcony as they smoked nargiles. I guess he talked them through it. Not a good idea to bolt in such attire, in such company, in that country! The worst? Well, there have been a few rum episodes: notably a dinner of two lollipops eaten in a concrete room under bright light with no water, sanitation or light switch in sight! Plus a gentleman not quite 'all there' remaining outside the door all night muttering and groaning. Or witnessing my much cherished electric toothbrush skitter down a large hole filled with excrement in Mysore, India. On the plus side you can never forget the Hindu Kush or apricots drying on the rooftops in the villages of Hunza. My two best nights ever have been sleeping out under the stars in deserts on Charpoi (string beds). 3. 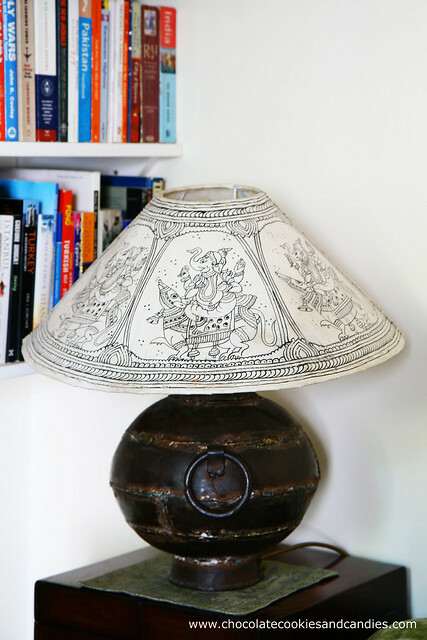 Your home is a treasure trove full of antiques and souvenirs handpicked from all over the world. Is there a particularly favorite piece? When did you start collecting these mementos? The momento buzz really started when I was about seven but I could neither have afforded or shopped for them, being young, penniless and essentially tasteless! My mother took a very daring holiday in 1976 to Turkey in a camper van with two friends (not my father). She sent back a wonderful seventies post card of the Kapali Carsi, or covered market, in Istanbul. I still have this card. A lady in purple chiffon leans seductively over all sorts of copper vessels that I realised many, many years later were cezves, nargiles, yoghurt containers and all sorts. She stares out with outrageous amounts of kohl on her eyes, eyes that demand you buy these bits and pieces nestling under her bosom. Well, that post card did it! By the time I was twenty I had travelled to Jordan and on a separate occasion to Israel, both on a pittance, and come back with nothing from either country. So I really started buying things when I was about twenty-four and found a wonderful metal Tibetan tea pot with dragons on in a shop in Upper Street, Islington. I found a beautiful lacquer Chinese work basket in a charity shop nearby and keep Uzbek textiles and tassels and a talisman in it now. I added saddlebags purchased from a young Afghani guy called Aziz at Camden Market, the Afghan pot in one of the pictures is also from him. One of my favourite pieces I purchased was a saddlebag mended with a sock. I loved that as it showed the humanity of the piece. I use the past tense as it has never surfaced from Turkey and I guess was lost in shipping. I still think of it. 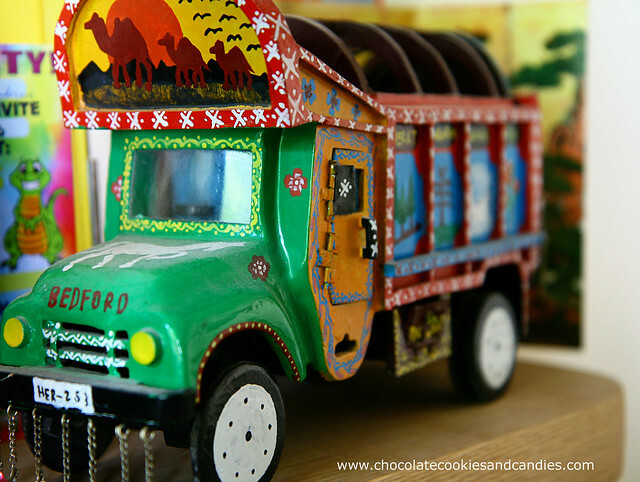 I subsequently added bits and pieces from visits to India and Pakistan and my time in Turkey. I actually like to buy clothes from my all my travels and I wear everything I purchase. 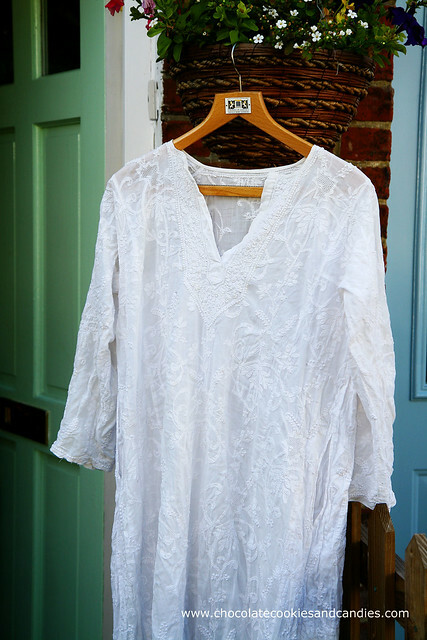 I have four treasured pieces: one is my now rather fragile nightgown which is an extremely fine example of Chikan work from Lucknow, India. Traditionally Chikan work is white thread on cotton or muslin. The piece is beautiful light muslin heavily embroidered and created for the Saudi male attire market. I had to have it. I treasure the two scarves purchased from a Tibetan lady during a dust storm in Himachal Pradesh. A Tibetan opera was going on near the shop.They are both large pure silk Tibetan opera scarves, designed to be used in performance. 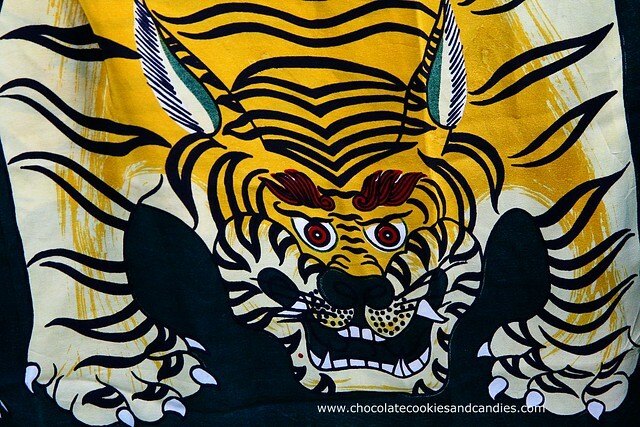 Each scarf has two wonderful, fierce tigers on with vast claws and teeth and thick and satisfying hand rolled edges. I purchased the two she had, one for my much loved and extremely talented late aunt and one for me. My aunt had a marvellous eye for mementos. She could also upholster with kelims and make tassels. These scarves will be passed on through the family. 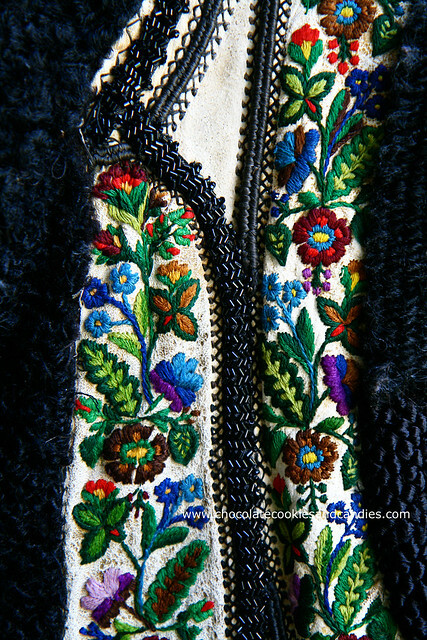 In winter I wear an antique Hungarian waistcoat purchased in Budapest, the leather is beautifully and skillfully embroidered. Such pieces will no longer be available soon I am sure. 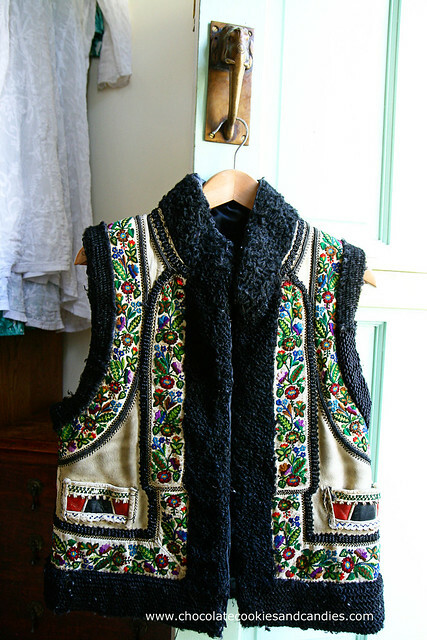 Hungarian vest. Take a note of the door handle. It's in the shape of an elephant trunk. I will be looking fordward to reading part 2. I enjoyed reading Frances interview so much. Thank you very much for sharing :). I was following your blog from the beginning but I am always too busy to leave a comment. I am having a few days off and I couldn't help by stop here and leave some comments ;). Thank you for sharing your wonderful photos, your wonderful lists (please keep posting lists, I LOVE them), your tips, places.... It's great to find a place where you can read about places, fashion (not trends), travels... Thank you :). Simplykir, your feedback means a lot to me. In fact, you've literally made my day so thank YOU! I've got more lists on the backburner but I'm so glad you like them. I was hoping I didn't bore my readers. Thank you ever so much for taking the time to write. Much appreciated! Hi, I absolutely love these types of interview posts. I always enjoy finding out more about people, their passions and experiences, their way of life. Maybe it's because I don't get out of Canada enough (haha). Great post! Looking forward to reading more. MMC, I've met so many interesting ladies who have such incredible lives. I'm just grateful a few allow me to be their "voice"
Frances is a lovely person with interesting stories and is also a local fashion icon! I completely agree, Sharon! She is all that and more. She leads such an interesting life!